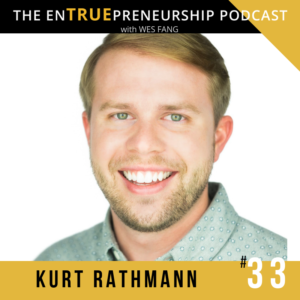 On our Chief Strategy Officer Wes Fang’s The EnTRUEpreneurship Podcast, Wes speaks with Kurt Rathmann, CEO and Founder of ScaleFactor, Inc. When Rathmann started ScaleFactor five years ago, he simply wanted to enable small- to medium-sized businesses (SMBs) to automate time-consuming accounting tasks. Since that day in 2014 around his living room table, ScaleFactor has grown into a thriving software business whose sole purposes is to free SMBs of mundane back office work to focus on their passions. In the podcast, Kurt describes his entrepreneurial journey which started in elementary school. Looking back from 2019, Rathmann’s experience is diverse, having owned successful businesses since he was a high school senior. As Rathmann rehashes his past, he shares lessons learned from each of his unique business experiences, including what it takes to delight customers, the value of being at the bottom of the proverbial “totem pole,” what it takes to scale a company quickly, and much more. 2:00: Kurt rehashes his early business endeavors — from selling lanyards in the 4th grade to mowing lawns to owning a 17-employee lighting company as a high schooler. 9:24: Kurt discloses what he believes was the biggest key to earning business for his lighting company, which involved putting customer needs first, no matter the difficulty. 12:07: Rathmann reflects on his first job out of college and the humbling — yet rewarding — reality of being the least important employee in a huge company. 15:28: Kurt discusses what drove him to leave his gig at the large company and the events that made him a CFO by the young age of 24. 19:58: Rathmann describes the project that became an obsession and, ultimately, became ScaleFactor. 25:08: Kurt walks through how ScaleFactor picked up its first clients — a few of which were on board even before the business officially got started. 27:29: Rathmann reflects on ScaleFactor’s inspirational first year as a company, being completely bootstrapped with no external funding, and how it locked in its first investment rounds. 30:59: Rathmann discusses the most challenging part of scaling a company quickly and describes how to navigate those waters well. 33:11: Kurt walks through his latest investment rounds — including $40M invested in 2018 — and discusses his company’s direction moving forward in 2019. 37:35: Kurt shares his most valuable advice, which involves embracing volatility in order to grow.